In or around October or November, I noticed that more and more people would list me on Twitter using a tool called Formulists. At first, I’ll admit, I was a little skeptical. To a certain extent, it seemed like Formulists was a scam. Twitter has its own list builder. So, what would be the point of using a replica product? Especially one that seemed to promote itself at every turn? (How many times have you been added to a Twitter list and noticed that it was “generated by @formulists” in the description?) Plus, Formulists is not a separate platform like Hootsuite or TweetDeck so I couldn’t see the added value. As someone who has spent a great deal of time building and tweaking her Twitter lists (see: my AMLAWTweeple project), this notion of self-updating lists piqued my curiosity. I received an awesome response – and then a follow-up Power Point presentation(!) – from Natalie Michelson, Marketing Manager at Formulists, and I became a believer. Formulists is not actually meant to be used instead Twitter’s list option but rather to complement it. A Formulists-made Twitter list, is still a Twitter list- viewable from your Twitter home page or client. However, the benefit of using Formulists to make some or all of your Twitter lists, is that Formulists takes care of a lot of the hard work for you that is involved in both list creation and list maintenance. As one classic example, making a “locals” list of the people you follow manually, would require you to click on the profile pages of each person you follow, see where they are from and then manually add them to your “locals I follow” list. Using Formulists, you can filter all the people you follow by location within a minute Additionally, Formulists-made lists update themselves daily so that if you follow another person from you city, they will automatically be added to this list too. Because they are dynamic and automatically-updated, Formulists lists can also be used to do things Twitter lists couldn’t do in the past, like show you who recently unfollowed you or who your friends talk to most. And because this information is being shown via a Twitter list, you can easily view and act on it from you Twitter client or homepage. 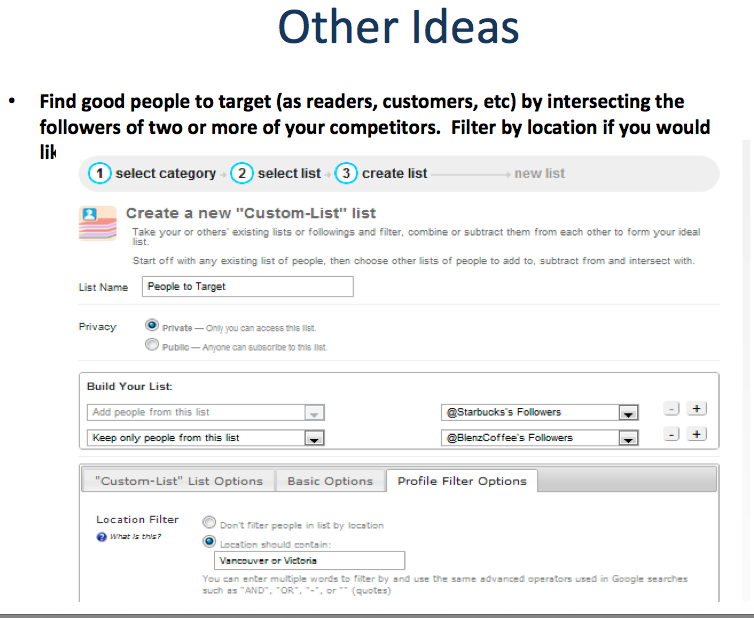 Mainly, I took Natalie’s advice and created lists to target potential clients by location. While I didn’t delete my old lists, I now use a few private lists that are, yes, generated by @Formulists. Do you use Formulists? What do you think?